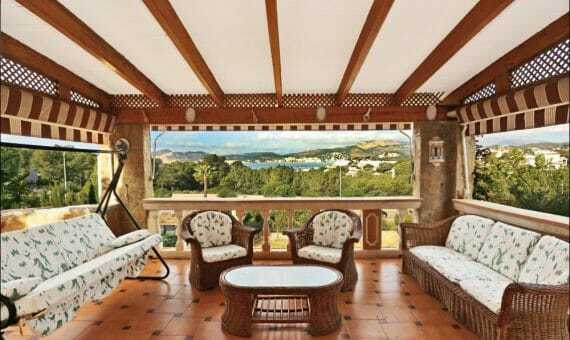 Magnificent villa in a traditional style in Santa Ponsa, Mallorca. The house, built in 2001, is situated on a private plot of 1.300 m², and offers 290 sqm of living area divided between main house of 200 sqm and guest apartment of 90 sqm. The main living area consists on a spacious bright living-dining room with fireplace, a separate kitchen, 3 bedrooms, 2 bathrooms (1 en suite), 1 guest toilet, and a utility room. Guest apartment includes a living room, a separate kitchen, 2 bedrooms, and 2 bathrooms (1 en suite and one toilet). On the upper level there is a spacious terrace with magnificent panoramic sea views. The house has air conditioning, alarm system, ADSL line, satellite TV, has spacious garage for 4 cars, storage room and much more. 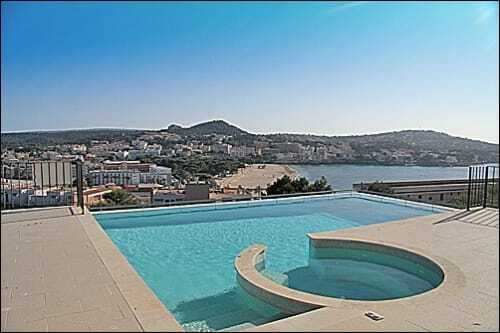 In addition, this villa will gives you roof top terrace with a breath-taking view of the sea and the Malgrat Islands. A beautiful garden with fruit trees and automatic irrigation, as well as a large outdoor terrace with a swimming pool, outdoor shower, and 2 barbecues surround a villa. The purchase of furniture can be negotiated. Excellent location of the house allows you to visit the local beach and marina, as well as to use the services of restaurants, shopping centres and golf courses.